Flying has always been a dream for humanity. It was always associated with freedom, bringing the possibility to go wherever wanted, regardless of terrain and conditions. After all, one of the most known myths about flight actually talks about freedom (and its risks): the legend of Daedalus, the Greek craftsman, prisoner in the island of Crete with his son, Icarus. Knowing that their only way out of the island was through the air, Daedalus builds wings out of wax and feathers, both for him and his son. Once airborne and free, Icarus flies higher and higher, so close to the Sun that his wings’ wax is melted away by the heat. The higher the rise, the tougher the fall. This story, commonly used to exemplify the dangers of excessive human ambition, could as well illustrate the history of human attempts at flying until the 19th century. Many people tried to imitate the flight of birds, flapping artificial wings made of wood, canvas and feathers. Some even put their own lives at stake, jumping from towers and flapping as vigorously as possible. All of these attempts failed, often with disastrous results. The reason is simple: humans do not have enough muscular strength in their arms to lift their own body weight. 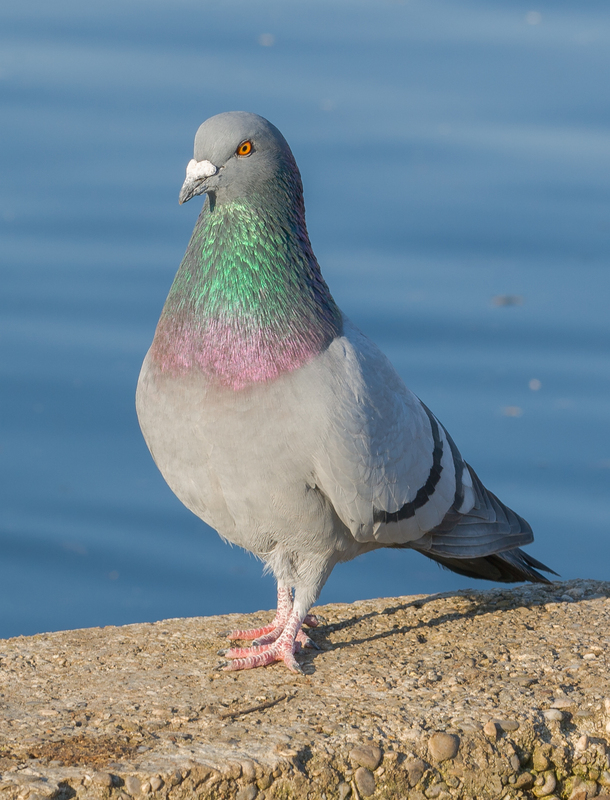 Rock dove (columba livia): notice the size of the chest, accommodating large pectoral muscles. All these attempts at heavier than air flying would change radically when George Cayley (1773-1857) entered the scene. (Before we go any further, a side note: there had been significant progress in air travel with hydrogen and hot air balloons before that moment, but this topic was left aside for this series, focusing only on aerodynes instead). George Cayley was an English nobleman and engineer who made important contributions to many fields of science and engineering. However, he is mostly renowned for his ground-breaking work on aeronautics. He is often considered to be the father of modern aviation. George Cayley took something as complex as the flight of a heavier than air machine, and decomposed it into three simpler functions, each one of them performed by a separate element. Firstly, a flying machine needs a lifting dive to counteract its weight. This can be done with a wing with a cambered geometry and a certain inclination with respect to the incident wind (this is called “angle of attack”). The lift generated by the wing is proportional to the square of its airspeed, so the machine will need to move at a certain speed to achieve sustained flight (hence the need for runways to speed up before becoming airborne). The machine’s movement through air will generate drag pulling it backwards: a propulsion device is needed to compensate it, thus reaching equilibrium. The ratio between the lift and drag generated by a wing will be later called “efficiency”, and would become a vital parameter in fuel efficiency. Finally, control surfaces are needed to give the machine stability and maneuverability, allowing it to change its orientation on demand. In a nutshell, this is the essence of modern aviation. Modern aircraft are still classified according to the method they use for propulsion and generating lift. Cayley developed his ideas into several gliders, one of them capable of carrying a human being. 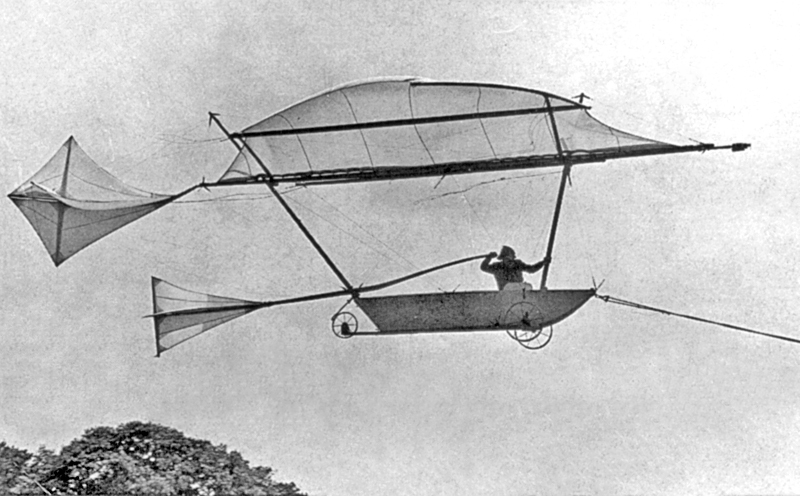 A replica of George Cayley’s human-carrying glider. The first one is the need of a light, yet powerful, propulsion system. Any extra weight penalizes flight, requiring the generation of more lift. The second one is the importance of studying the aerodynamics of the airplane (this means, the way the air moves around it). Especially, the aerodynamics of the wing must be well understood so as to design an efficient wing, one that will generate the necessary lift with as little drag as possible. He already understood that the main mechanism for generating lift is creating a pressure difference between both sides of a wing. This is done by accelerating the airflow on the upper surface of the wing and slowing it down in the lower surface of the wing. Furthermore, Cayley also found out that cambered wings (wings with curvature) generate more lift than flat plates. Further advancements in these two fields made the Wright brother’s historic powered flight possible, as we will see in the next three chapters of “The Day Aviation Changed”.